Product prices and availability are accurate as of 2019-04-20 13:53:02 EDT and are subject to change. Any price and availability information displayed on http://www.amazon.com/ at the time of purchase will apply to the purchase of this product. An all-in-one dressing for fluid handling. Moisture vapor transmission rate (MVTR) adjusts to fluid level. Highly absorbent. Helps create ideal healing environment. 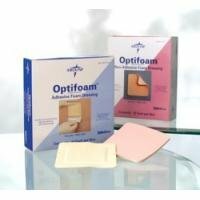 Waterproof outer layer protects wound and keeps bacteria out (except Optifoam Basic).Indications: pressure ulcers, partial and full-thickness wounds, leg ulcers, donor sites, lacerations and abrasions, skin tears, and first- and second-degree burns. Contraindications: third-degree burns and lesions with active vasculitis. May be left in place for up to 7 days; Dressing change frequency will depend on amount of drainage.